A long van-ride up to the rural village of Patacancha. A confused hike around the town trying to locate the health clinic. An hour of sitting in the grass with yarn tying my belt loops to a twig stuck in the ground. A very bumpy ride through narrow mountain-passes on a bike whose seat would only rest at the lowest possible point. All of these things may seem strange, unrelated, and uncomfortable… but in fact, they made up one of the best days I’ve had in Peru so far. Along with six other excited volunteers, I hopped in a van up to Patacancha at 8:30 in the morning. Our plan was to deliver supplies to the health clinic and then mountain bike back to our little valley town of Ollanta afterward, while three of us had decided to do a weaving lesson at the Weaving Center and bike home separately. With bikes attached to the roof of the van and plenty of supplies in tow, we bumped up to Patacancha in good spirits, if not without a tiny bit of nervousness at the steepness of the road and height of the drop-off next to it. After some shared skittles and snacks, we arrived in Patacancha ready for our delivery and subsequent adventure. The guide had directed us in the general direction of the Posta – the health center – and we set off with our bags. Ten minutes later, huffing and puffing in the high altitude, we hiked through the hilly town with no sign of the Posta…So naturally we climbed through a gap in a fence to find ourselves in the courtyard of a school with many poncho-clad adolescent boys waving buenos dias to us gringas. A few more courtyards later, we made it to the Posta and successfully delivered the medical supplies. Mission accomplished! At this point, Amanda, Sarah, and I, who had arranged for a weaving lesson, picked up our bikes and trekked them back up the hill to the Weaving Center. I had been particularly excited about this trip because as a weaving project volunteer, I’ve been learning about the rich textile tradition of Patacancha for a year now, and have been itching to see it for myself since I arrived in Peru three weeks ago. The three weavers each picked one of us, and we sat in the grass together to begin. I found myself feeling extremely drab in my grey sweater, jeans, and hiking boots, compared to the beautiful, saturated colors of the woven skirts, button-class jackets, bright sweaters, and beaded hats of the Quechua women. Perhaps to compensate, I chose yarn for my bracelet in colors of florescent orange and pink, as well as a more muted blue, so as not to be completely blinded by the brightness. 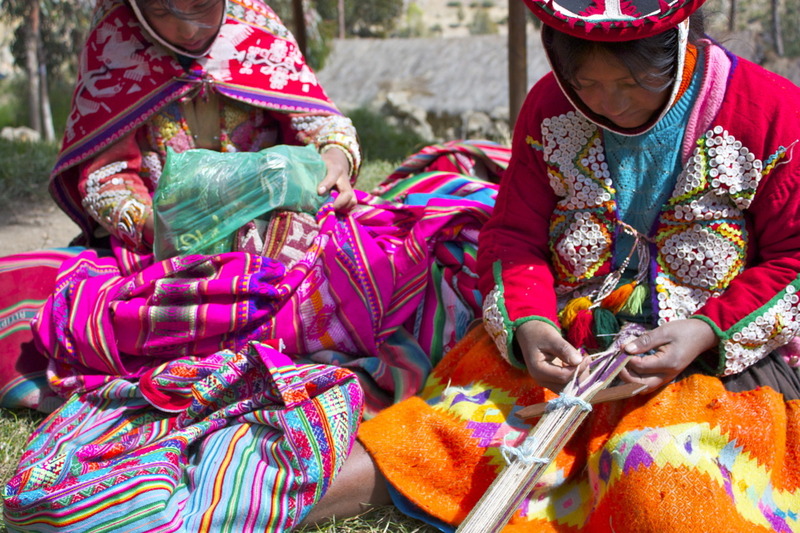 I watched as my fifteen year old teacher, Graciela (shown weaving in the photo, right), planted four sticks in the ground and then wrapped each color around in a figure eight pattern. After all the yarn was wrapped, she tied different string around certain threads to separate them, and then tied one end of the bundle to my belt loops. I was a bit confused by this process – the people of Patacancha speak Quechua so the communication was mostly non-verbal. Although Graciela spoke a little Spanish, let’s face it: I’m still at a beginner Spanish level and am usually resigned to the daily confusion that goes along with this fact. Even so, Graciela was a great teacher. After the yarn was tied to my jeans and my dutiful instructor demonstrated a stitch, I quickly caught on to the fascinating weaving process. The pattern in Peruvian weaving is a result of the vertical strings set up on the loom (or in my case, between my belt loops and the stick in the ground!). Instead of passing a horizontal stitch through the strings to make a pattern, the horizontal stitch is invisible, only used to hold the vertical string in place to create a vertical pattern. I had a wonderful time making the bracelet, even figuring out how to slightly lean back to create subtle tightness in the threads. Graciela seemed pleased, occasionally correcting my stitches to teach with body language, while happily chatting in Quechua with the other weavers. Once we were all finished with our bracelets, each with a different beautiful patterns and colors, we said thank you and goodbye, and tentatively began our journey down the mountain. I quickly discovered that my bicycle seat wouldn’t stay at the right height, slowly getting weighed down to the lowest possible level. Thus, I may have looked like a clown on a tricycle, biking around with my knees up to my chest. Good thing I’m a conveniently petite 5’3”! It didn’t matter so much, though, because it was necessary to stand up a lot to absorb the constant shockwave of the gravelly dirt roads. It was slow going at first, since we were each a tiny bit nervous on the steep, rocky paths. With more confidence, though, we picked up the pace a little and really enjoyed ourselves, bumping happily down the windy roads. We passed waterfalls, rocky streams, amazing views of farmlands, little villages, and made it back to Ollanta in time for lunch. That evening, after a much-needed shower and a cup of coffee, I went to a despedido, a party to say goodbye to some of our Awamaki volunteers. We had dinner at one of our favorite restaurants and a beers at our favorite pub. Although I’m sad to say goodbye to some of my friends who are going back home, it was the perfect ending to an awesome day. Hannah Mode is a Weaving Project and Media Volunteer from Massachusetts. She just finished her undergrad degree in Studio Art and Art History from Skidmore College, and is thrilled to be working with Awamaki for two months this summer!